Once you have identified and purchased a website domain name you need to point your domain name to your web hosting. 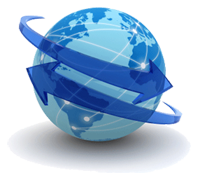 David Martin Design's reliable web hosting service keeps your website up and running on the internet. If you purchase web hosting from GoDaddy, BlueHost, HostGator, NameCheap, or many of the other choices out there you will need to select from a ton of different options. Web Hosting options can be complicated and David will consult with you to identify the best choices that fit your business model based on your business goals. Options for web hosting include choosing an operating system (Linux, Windows, Amazon, + many other options), making sure your website is SSL enabled so your domain shows up as a secure https (important for SEO ranking, user experience, and security), and setting up email (Google's G-Suite (recommended), Microsoft, Yahoo, free email vs professional). Of course there are other things to consider like storage space, whether the hard drive is SSD (much faster), and where the location of the machine is. All of these things matter significantly to your website performance and search engine ranking. By choosing to work with David Martin Design you will have the burden of having to make the choices alone lifted from you. David focuses on best practices and has worked with hundreds of clients using all sorts of different setups. Save time and money by making the right choice, the first time. Contact David Martin Design to get started today. David will manage your business website hosting and makes sure your website is secure and optimized for speed. FREE SSL Certificate - Secure credit card numbers, passwords and other sensitive data your visitors submit through your site. Unlimited website storage (within reason) so you can upload all of the media that you need.